Official real estate sales numbers were recently released by Florida Realtors and as expected, median and average prices for single family homes rose again in April. 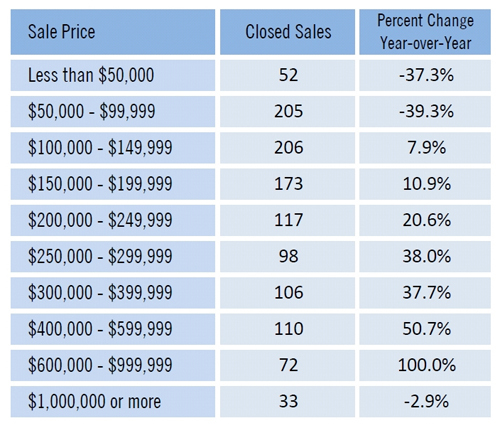 The median sale price rose 29.8% over last year from $140,199 to $182,000 this year. The average sale price rose 23.1% from $237,281 last April to $292,201 this year. Prices have definitely risen this season; however they typically do this time of year. We are comparing numbers of last year at same time, so it’s a legitimate 30% increase over last year. 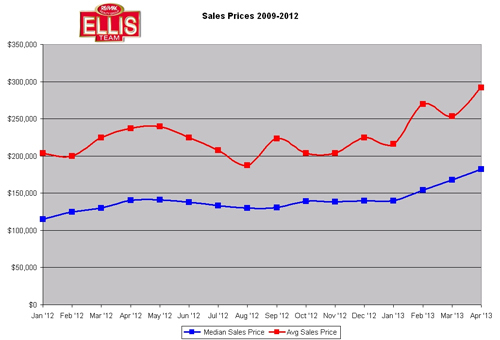 April 2013 prices are up over March numbers which is also typical. April’s $182,000 was up over March’s $168,000. Going forward we’ll have to watch as last year prices hit their plateau before steadying out the rest of the year. When analyzing by price range again we see a drop in closed sales below $100,000 simply because there isn’t much inventory there as home prices have graduated higher. Those some entry level or investment homes are just higher in price again this year. Finding sub $100k priced homes is difficult at best. When prices are rising people automatically assume it’s across the board and they can add 30% to last year’s home value regardless of what price range their home is in. This simply is not true, although we have seen increased sales in almost every category. The over $1 Million category continues to struggle. The SW Florida real estate market is on the rise, but the overall economy may be holding back super premium prices combined with excess inventory in the $ 1Million+ category. We’re really seeing excellent sales in the $200,000-$400,000 range. That’s the sweet spot right now in Southwest Florida. This may change in time, but right now that’s it. With companies like Hertz moving to Estero and another company I’m hearing rumors about, this sweet spot could do very well for years to come. Eventually the over $400,000 range will pick up more as well. It’s doing OK, but if you remember back to the hay days, it seemed any new home in South Fort Myers was $400,000 and up. Now you can get a pretty nice home for $400k. The financial markets were spooked last week Fed reports that some Fed governors support raising interest rates by ending the government bond buying spree if we see continued economic development. This would essentially raise rates. While this will happen one day, I doubt there’s enough support to do it now. This will eventually cut into buyer’s buying power when that happens. Nationally home prices were up 10.2%. SW Florida is absolutely leading the nation right now. We did so back in the run-up. The difference today is its sustainable and we’re still at or near replacement costs. Back in the upswing in 2005 we were so far over replacement cost. We were artificially too low in price for the last 7 years and the market has been correcting the past 3-4 years now. Look for continued strength as we have positive economic news locally. Keep your eye on national economic news and interest rates and we’ll let you know if we hear more details about landing another big company. It really makes no sense to report on that unless and until it happens. As you might have read, the Hertz deal almost didn’t happen, so we never believe anything until the ink is on the paper. Posted in Cape Coral, Cape Coral Real Estate, Fort Myers, Fort Myers Real Estate, Southwest Florida Real Estate.Tagged Bonita Springs real este market, Cape Coral real estate, Find out what your home is worth, Florda Realtors, Fort Myers home prices, hertz, real estate video, SW Florida Real Estate Market Continues Its Upward Trend.